Based on a previous design, the inspiration for this print comes from one of my favourite TV shows at the moment ‘Breaking Bad’ for those who haven’t seen it I highly recommend you give it a try! 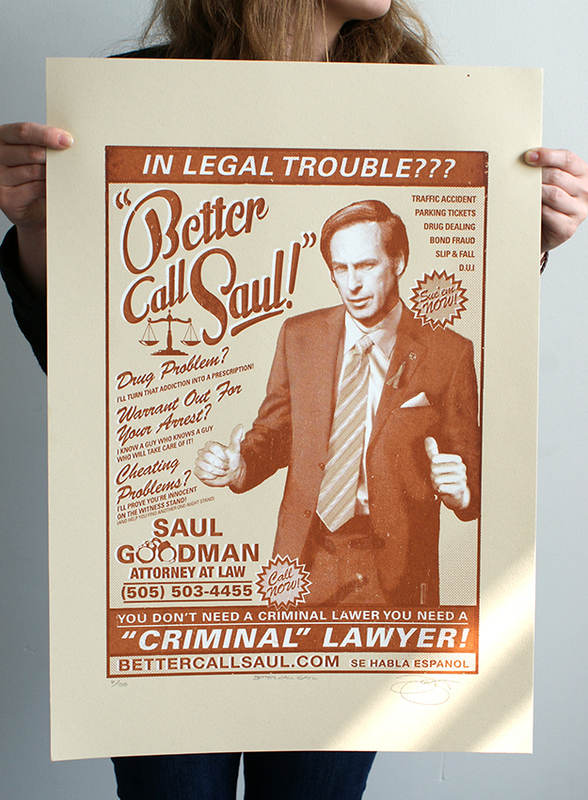 Saul Goodman is VERY unethical lawyer, but very good at helping his criminal clients off the hook, plus he’s very funny too! This 2 colour hand pulled screen print measures 42cm x 59cm (approx) and is printed on 250gsm Annigoni acid free art stock. Each print is signed & numbered and is strictly limited to an edition of 250 so once they’re gone they’re gone. Posted in Paintings. Tagged with Better Call Saul, Breaking Bad. In legal trouble? 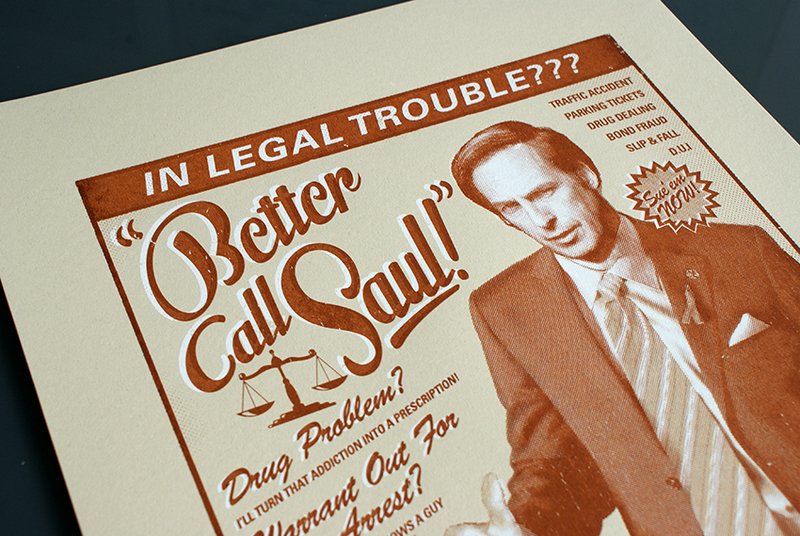 Better Call Saul! The inspiration for this print comes from one of my favourite TV shows at the moment ‘Breaking Bad’ for those who haven’t seen it I highly recommend you give it a try! 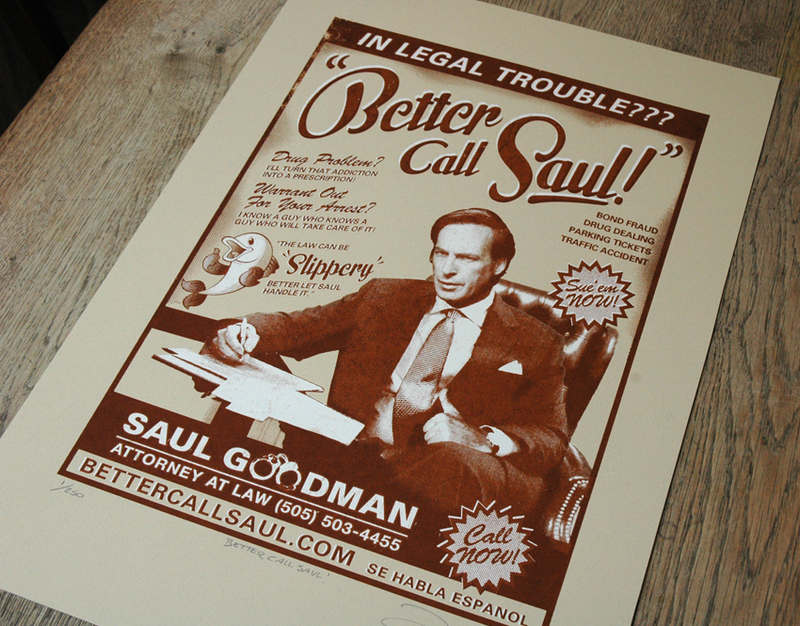 Saul Goodman is VERY unethical lawyer, but very good at helping his criminal clients off the hook, plus he’s very funny too! This 2 colour hand pulled screen print measures 42cm x 59cm (approx) and is printed on 250gsm Annigoni acid free art stock. Each print is signed & numbered and is strictly limited to an edition of 150 so once they’re gone they’re gone. Posted in Prints. 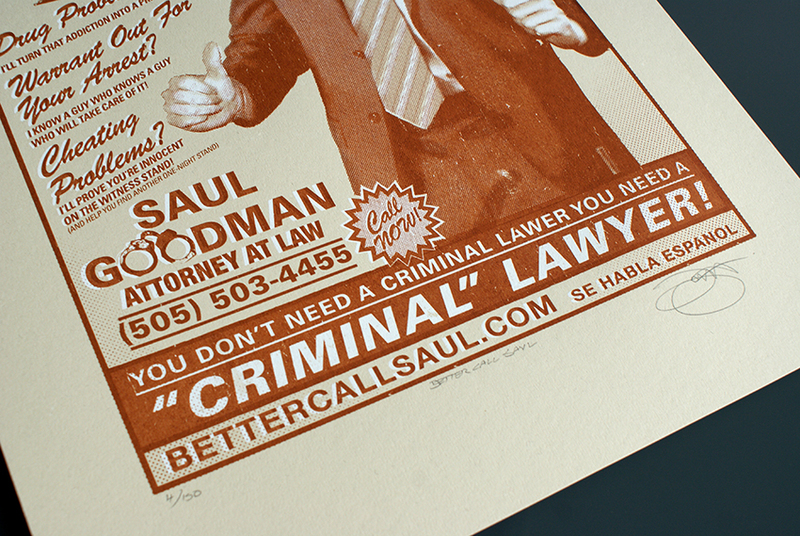 Tagged with Better Call Saul, Breaking Bad, Brown, Saul Goodman.